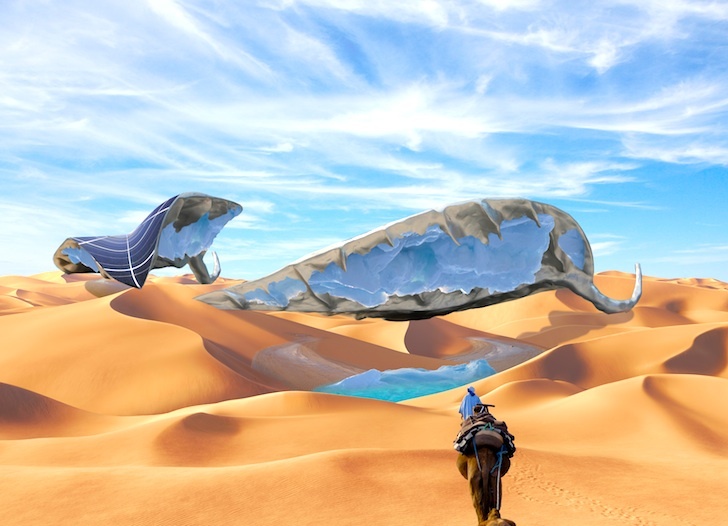 Artist Ap Verheggen has hatched a plan in cooperation with Cofely Refrigeration to create a solar-powered leaf-shaped structure that uses condensation principles to create ice in the Sahara desert. If this sounds too good to be true, read on - it turns out that Cofely and Verheggen, who is also the Cultural Ambassador for UNESCO-IHE (the water training institute of the UN) have simulated desert conditions in a shipping container to test the product's theory, and have already produced 10 cm of ice. So how does this work? 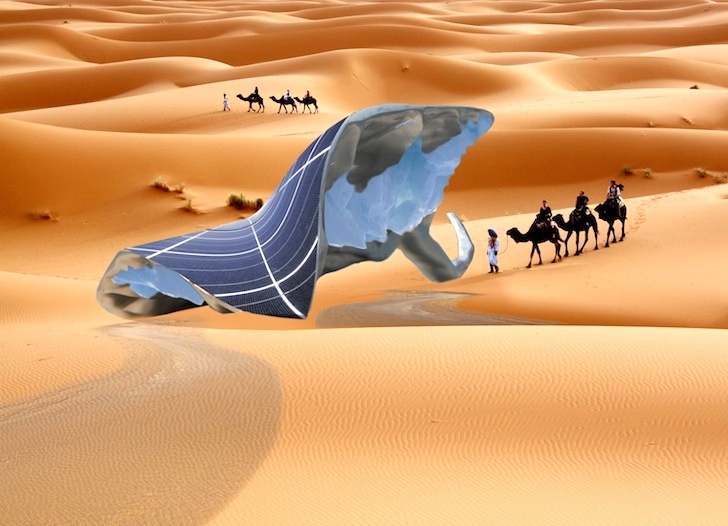 The 200 m2 elm-leaf shaped structure has a PV cell coated underbelly, which powers cooling condensers that in turn convert humidity from the desert air into ice. Verheggen told the Engineer that although the Sahara desert may not seem to have sufficient humidity to create optimum ice-making conditions, it turns out that tests show that the air in Egypt has the same levels of humidity as the Netherlands. But before they trek off to the Sahara to create their glacier, the designers are working in a simulated environment back home. By heating the shipping container and running a humidifier, Cofely and Verheggen have reproduced the desert’s unique climatic conditions. A fan, which is designed to simulates fierce desert winds, is pointed at the ice that collects on a aluminum shield of sorts. As the ice grows from the condensation, water collects at the base. Given that the Middle East region is facing chronic water shortages, this is quite possibly one of the most important projects in the running, in close second perhaps only to the 500 MW Moroccan solar power plant that is slated to break ground next year as part of the Desertec initiative. I would be interested to find out more about this poject, but i can't find anywhere that has good information on the science behind it? @rasheno: how does ice \"hurt\" a desert environment please explain? How curious that the humidity should be the same as the Netherlands. I am sorry but I fail to see the benefit of this to humanity as a whole. To me it seems to only encourage the irresponsible expansion of human occupancy on desert land. I have lived in this region for 7 years now and have only found that generally speaking people here have no idea what is really happening in the world environmentally, they are on a roller coaster of consumerism and irresponsible development. The amount of waste and carbon footprints brought on my the rapid development and its subsequent construction of non-environmentally responsible building projects etc.. is unbelievable. Encouraging humans to further expand their habitat into desert environments without preparing a society for the evolutionary awareness of such steps and their impacts and consequences is suicide for our planet. For example just looking at the Dubai skyline and other construction projects, I do not see one single construction project that used sustainable and environmentally friendly construction practices and materials. When a society hasn't embraced the most important principals of sustainability how can a UN funded project like this for this region be justified. We have water shortage because of irresponsible growth in this region. Most importantly, there is no policing of environmental policies so most of the water tablets are polluted from hazardous processes by industries and most private businesses in this region. One example is a cement processing plant that spews out so much dust and residue from processing cement that most of the villagers in that area have asthma. In my opinion, education and fostering of awareness in people from this region about global environmental problems and how this region itself, being a heavy fossil fuel burning region, is contributing to the problem is the most important thing that UN should be pouring its money into. Already they have managed to create a 10cm slap of ice, demonstrating the very real possibility that this project could become a reality. UNESCO-IHE is providing support for the project!